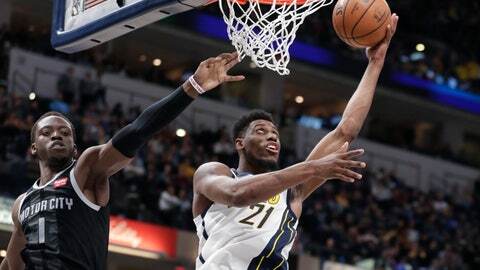 INDIANAPOLIS (AP) — The Indiana Pacers have taken adversity and used it to their advantage during a breakout December. Oladipo has been back in Indiana’s lineup since Dec. 12, but against Detroit he scored only seven points. The Pacers, much like they did in his absence, relied on an onslaught of scoring from their other four starters and key contributions off of the bench. The Pacers are 7-2 since Oladipo’s return, but it was a 4-1 stretch prior to his return that gave the Pacers the confidence and know-how to pull out games without a major contribution from their best player. Oladipo chalked up the lackluster Friday to his gradual return to form, but noted a win is all he’s ever concerned with. The Pistons came out flat, contributing to a stale first few minutes. Unlike Indiana, which had seven players in double figures, Detroit didn’t have someone step up to ignite the offense. The Pistons shot only 37 percent from the floor. Griffin brought a tablet onto the court to argue a call with official J.T. Orr during the second half. It’s unclear which call Griffin was disputing, but Orr patiently watched the replay on Griffin’s device before appearing to offer an explanation to the Pistons star. Pistons: Drummond entered the game leading the league with 15.4 rebounds per game. He got his 28th double-double of the season. … The Pistons are 5-14 against teams at or above .500. … Detroit’s 88 points tied for the second fewest the Pacers have allowed this season. Pacers: The Pacers shot 71 percent from the floor during the first quarter, recording 12 assists on 15 baskets. … Turner has at least three blocks in 15 of his last 22 games.